The only thing I was looking forward to this week, turned out to be everything I wanted to see. 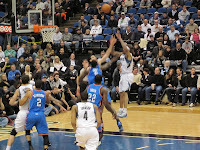 I'm in Minneapolis and the Oklahoma City Thunder were in town to play the Minnesota Timberwolves tonight at the Target Center. I wanted to watch the duo of Kevin Durant and Russell Westbrook. Don't get me wrong. I wanted a close game so all the starters would play the whole time. 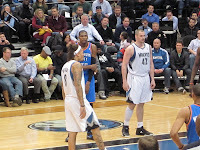 Further, I've caught the Timberwolves' front court in person before, and Michael Beasley and Kevin Love do not disappoint. Tonight Corey Brewer came up big also. 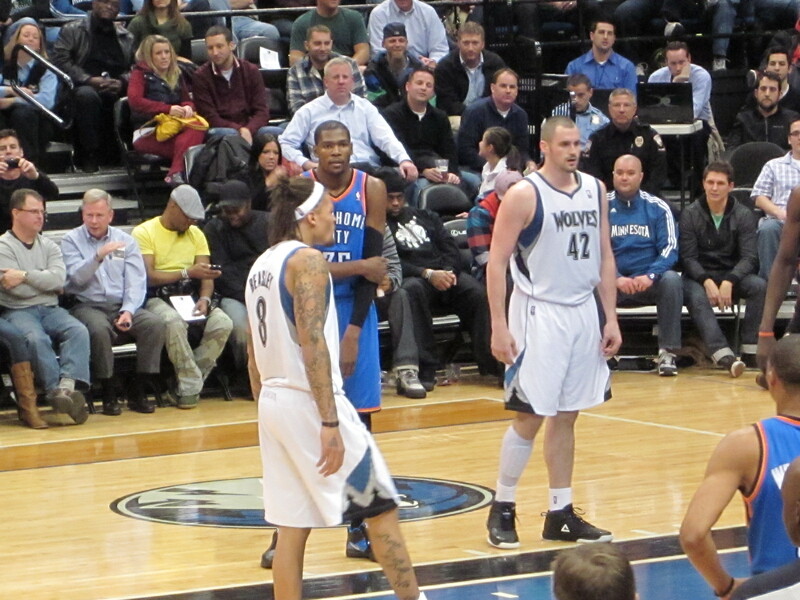 The Timberwolves came out hot, and that was exciting for the home crowd to see. 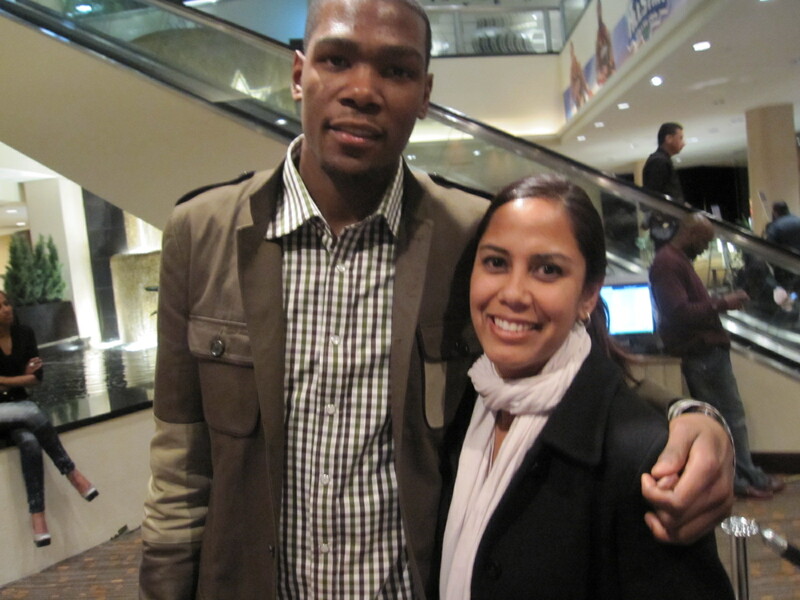 I'm a Kevin Durant fan. I like that he's humble, young, and a hard worker. He's also got a lot of per-son-al-i-ty, which is evident if you keep up with him on Twitter and/or Facebook. KD's neighbor, Matthias Murphy (Twitter: kd35sneighbor), also shares his experiences with KD through Tweets and videos. If you're not following him/them and you like to laugh ~ you're only hurting yourself. If you want to check out some of the videos, check out his Youtube channel. The link to it is in the right hand column for your convenience. It looked like someone got a hold of KD's arm during the game, because I saw him holding his elbow and telling the ref about it. At times he also looked like he was wincing in a little pain. 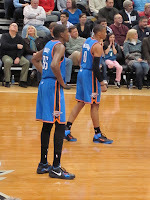 Scott Brooks' Thunder never led the game until the 4th Q, when Durant hit a free throw to finish a 3-point play (i.e. to put them in the lead, with a score of 87-86). 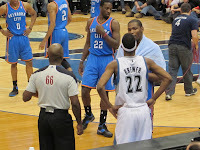 Like I said, the Timberwolves came out hot, but KD finally got into his rhythm and dropped 30 points. 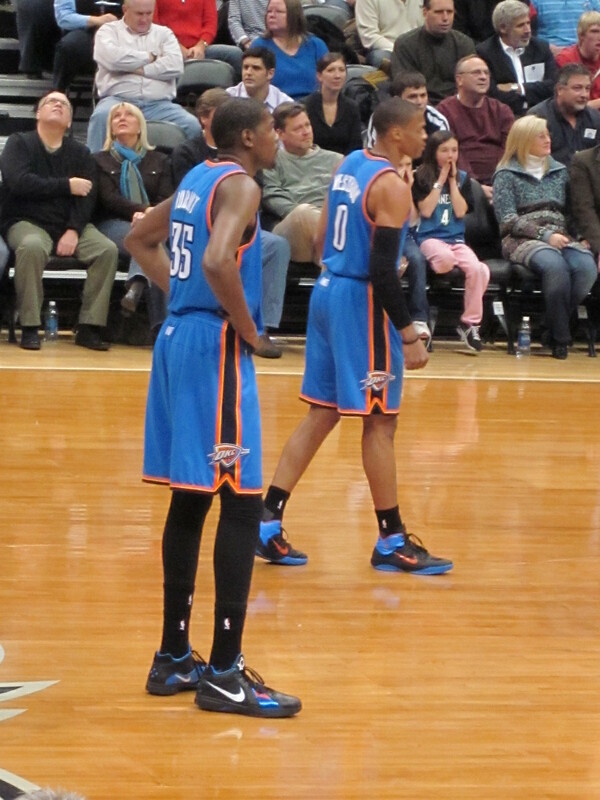 Russell Westbrook caught fire also and scored 25 to follow the charge. With about 2 minutes left in the game, the BLIND REFEREE gave KD his 6th foul and that was the end of the night for him. KD was no where near Corey Brewer when the foul was called. The foul should've been given to Serge Ibaka. Final score of the game was 111-103. The Thunder win (i.e. and cover, since the line was OKC -5.5). Thunder Up!